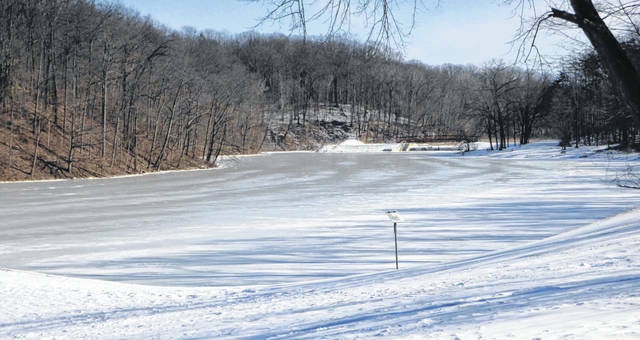 With temperatures at -8 degrees Wednesday morning, the lake at Mount Gilead State Park was frozen. The polar vortex hit north central Ohio with temperatures below zero and dangerous wind chills. MOUNT GILEAD — As temperatures dropped below zero, most Morrow County residents stayed indoors Wednesday during the Polar Vortex. ‘The kids and I made a crock pot chocolate lava cake, and enjoyed watching movies … and eating the lava cake,” Chesterville resident Cheyenne Holtrey Peck said. Others also chose options revolving around food. Sherry Cobb ventured out of the house, but only for a doctor’s appointment. She returned home quickly and began baking. Like many north central Ohioans, Nicole Evans Workman worked. Edison resident Phyllis Linton kept busy. “I made chili, washed dishes, sewed on a quilt. Now crocheting and watching the news,” she said. Lacie Kinsella was indoors — sort of. Teresa Spangler said she had to venture outside. Penny Brooke practiced her art. After a trip to Westerville Carla Luke Fleece returned home. Rosemary Kirkpatrick was at home with her kids. “But I made several trips outside with the dog. Extra layers and hats and gloves; it wasn’t that bad,” she said. Betty Randolph said she did crafts and cooked; Mary Ann Klein worked on her genealogy. Others did laundry, worked out on their treadmill and watched television. Sondra Herren-Carey walked over to give an elderly neighbor his medication and brought in some bunnies that belong her granddaughters. “I had an 8-year-old and 4-year-old stay over for the night. We played the game of Life and enjoyed Paw Patrol and Curious George,” she said.